Stress is a silent killer. At YouthBerry, our Anti-Stress supplement is designed to support you; not only will it help you control your stress, but will also help you manage your stress as they are fortified with a clinically proven compound made from extract of Red Orange Complex. 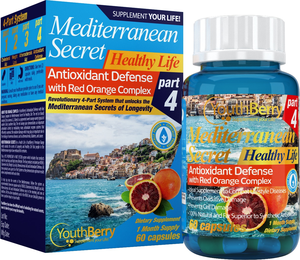 About Red Orange Complex in YouthBerry’s Antioxidant Defense with Red Orange Complex forMediterranean Secret for Healthy Life: The red (or blood) orange (Citrus sinensis (L.)Osbeck) is a pigmented sweet orange variety typical of eastern Sicily (southern Italy. The redorange juice demonstrates an important antioxidant activity by modulating many antioxidantenzyme systems that efficiently counteract the oxidative damage which may play an importantrole in the etiology of numerous diseases, such as atherosclerosis, diabetes, and cancer.